Continuing my saga, I have just left the Navy and accepted my first civilian job with Westinghouse Electric Company. It is August, 1980, and I have moved to Zion, Illinois, to work in the Westinghouse Nuclear Training Center (WNTC). I am an expert in Navy nuclear power technology but a novice in commercial nuclear power plant technology, so guess what is coming next? That’s right, more school!!!! Learning never stops! I spent my entire first year at WNTC learning about commercial nuclear power plants. There were some big differences between Navy and civilian, so I had to “unlearn” old paradigms and learn new paradigms. It took me one year of hard study to earn my certification as a senior reactor operator (SRO) instructor. With that certification under my belt, I was then qualified to teach trainees from commercial nuclear power plants who were preparing to take federal examinations to get their reactor operator (RO) and SRO licenses, which they needed to be able to operate a nuclear reactor. 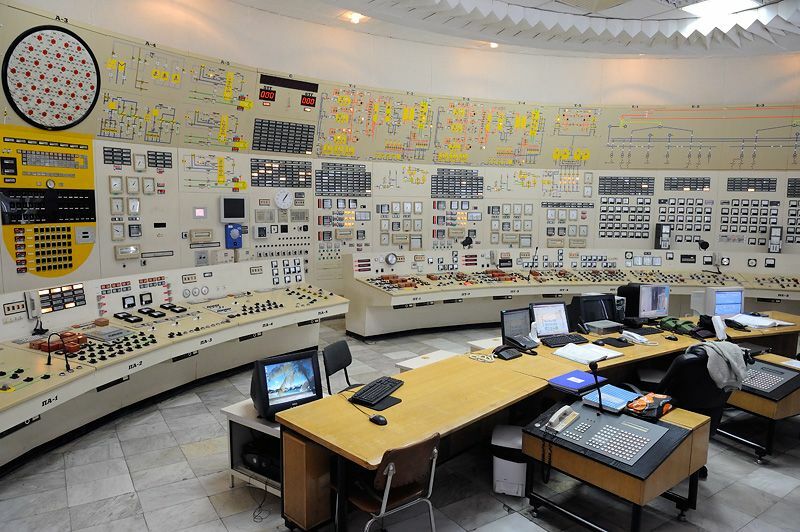 Shown below is a nuclear power plant control room simulator. It is like a real control room except that behind it is a computer rather than a real plant. I trained operators how to operate in the control room. I would use computer inputs to make things go wrong “in the power plant” and the operators would receive alarms and had to figure out what the problem was and how to respond correctly to it using only the control room indications. During the Navy, I married my first wife. During my first year at WNTC, I divorced her for reasons discussed in a previous chapter of my life. American divorces are usually bitter and acrimonious, and the poor, unemployed woman usually gets all the money, so I started my civilian life at WNTC with nothing more than a car, some clothes, and a lot of debt, courtesy of my ex-wife’s extravagant lifestyle. I spent every day of the first year subsisting on donuts, soup, bread, and coffee at a fast food restaurant chain called Dunkin’ Donuts. Dunkin’ Donuts doesn’t know it but they saved my life that first year because their food was very inexpensive and their delicious coffee was a “bottomless cup”, which meant all the free coffee refills I could drink. They don’t do that today. Today you pay for by the cup. After 3 years at WNTC, I had learned all I could learn there and I had taught all I could teach there, so there were no more challenges left for me there. Around 1983, a colleague of mine who had left WNTC earlier called me from Taiwan. He had joined a Westinghouse group that was building a nuclear power plant with two nuclear reactors at the southern tip of Taiwan, and they were looking for start-up engineers. The name of the plant was the Maanshan Nuclear Power Plant. I had a phone interview with the project lead there and he asked if I was interested in joining his team. I asked if I was qualified. He asked me if I was an SRO. I stated that I was. He then stated that I was qualified, so off to the southern tip of Taiwan I went to learn to be a start-up engineer. Maanshan Nuclear Power Plant was the third nuclear power plant built in Taiwan; hence, the Number 3. The big round buildings are called the Containment Buildings. They contain the nuclear reactors, which contain uranium fuel (U-235, U-238). Now you should know that I took my second wife with me to Taiwan. You may now be looking at me quizzically, asking “Wait a minute, Teacher Lee! You just got divorced. Where did your second wife suddenly come from?” Well, I have to chuckle at that question. You see, I married my second wife while I was working at WNTC, but I didn’t meet her there. I had met her years earlier. Her family had lived in China, then moved to South Vietnam where she was born and grew up. This was before Communist North Vietnam soldiers invaded South Vietnam and took it over. At the time I met her, South Vietnam and its national flag no longer existed. The city my wife was born in, Saigon, had been renamed as Ho Chi Minh City. It was named after the North Vietnamese leader at the time of the war. You may now be wondering, “Teacher Lee, how in the world did you meet your wife in the USA while going from college to Navy to WNTC? It seems you were awful busy during those years.” Well, that is an interesting story, some of which I will share with you here. Back in the 1960s, the USA was involved in a long, drawn-out war, which we called the Vietnam War. The USA was an ally of democratic South Vietnam, so we sent thousands and thousands of US soldiers overseas to help them repel the invading armies of Communist North Vietnam. The war lasted many years, and many, many young American soldiers lost their lives in that foreign land in that war. One of the many victims of that war was my wife’s biological father. My uncle, my father’s brother, was an American soldier who had fought in that war. My uncle ended up marrying my wife’s mother in South Vietnam and becoming my future wife’s step-father. So he later brought his wife and her daughter (my future wife) back to America. They had no place to stay, so they stayed at my parents’ house for a few months and then later found a house close by my house. Recall that I had three months a year off from college, what we called “summer break”. Each year I had to give one month of my summer break to the US Navy for NROTC training. During the other two months of summer break, I would return home. Well, the first summer I returned home, I found that my future wife and her mother were often visiting my parents. She was a young, shy girl who barely spoke any English. She was enrolled in the 10th Grade at the same high school I had gone to. I had just finished my first year of college. She struggled due to language problems but she eventually graduated from an American high school. So every summer for three years, we spent about two months together at my home. To make a long story short, after I divorced my first wife, my wife-to-be and I decided to get married in 1982, one year before I left for my new work assignment in Taiwan. My son was born during my first two years in Taiwan. After the nuclear plant started up, the start-up team (us Americans) had to return to the US and go our different ways. I ended up going to Pittsburgh where I worked as a Westinghouse instrumentation and controls (I&C) instructor. After a year doing that work, Taiwan requested a Westinghouse engineer from the start-up team to return to Taiwan to help them. No one wanted to go back, so I volunteered and we went back to Taiwan for another three years. My daughter was born in Taiwan during this period. So both my children were born in Taiwan about three years apart and on two separate trips. In the USA, when small children ask parents where babies come from, we tell them that babies are delivered to the house by flying birds called storks. So after a year working in South Carolina, I decided to quit Westinghouse after 10 years of employment, so I could earn the higher pay of a contractor. Thus, begins the next chapter in the story of my life.